I adore food, clearly. It's king in my world. But ruling right alongside it is the empress of all things ... the perfect cocktail. I've had many in my LA travels (I seem to drink more wine in New York), and must share with you what I consider to be some of the best cocktails in Los Angeles. 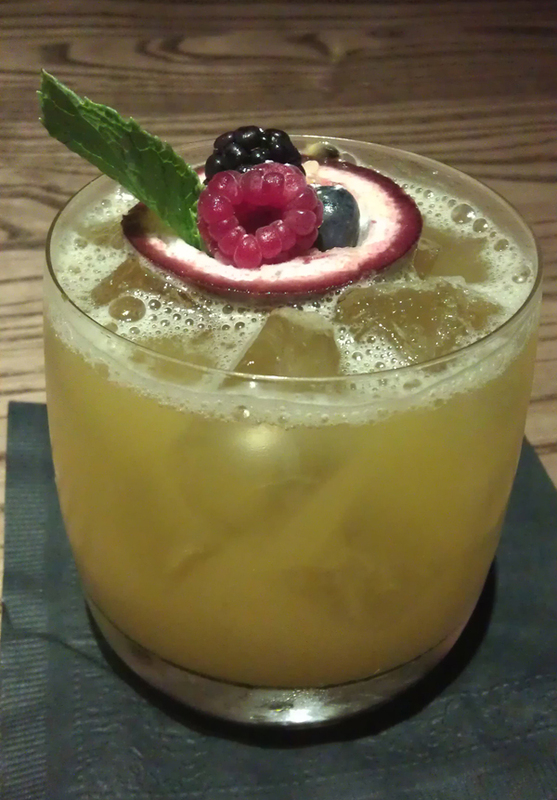 MIXOLOGY 101 @ Farmer's Market: Tennessee Squirrel — Jack Daniel’s, Disaronno amaretto, passion fruit syrup, fresh passion fruit & lemon juice, served over ice in an old-fashioned glass. 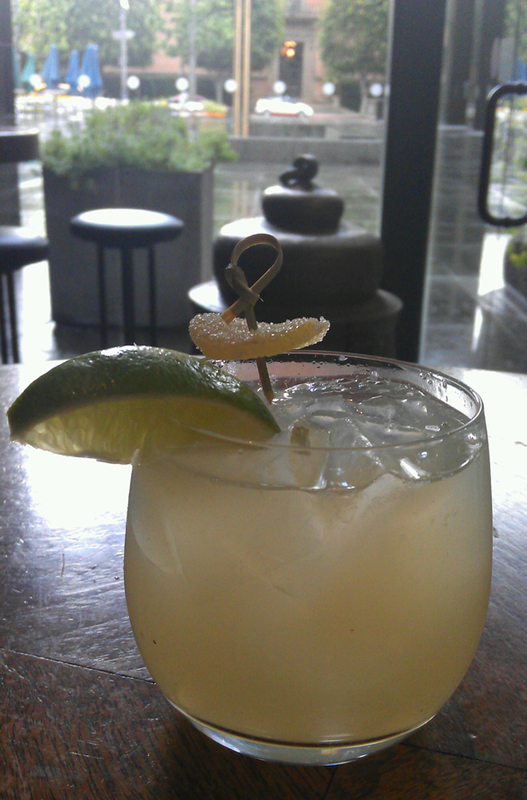 CHAYA DOWNTOWN: Spicy Ginger Margarita — ginger- and jalapeno-infused tequila, lime, candied ginger. I've already raved about Pizzeria Mozza, and will continue to rave every time I eat there. Today, though, it's all about the exceptional meal I had with my friend Tony at that other outstanding eatery conceived by genius trio Nancy Silverton, Mario Batali and Joseph Bastianich: Osteria Mozza. While Pizzeria Mozza is all ... well ... pizza and familiar Italian bites and classics, Osteria is vibrant, inspired, a lively twist on traditional Italian. It's rustic elements such as ridiculously fresh orato or branzino served whole, but also playful plates like Burrata with speck, English peas & mint. 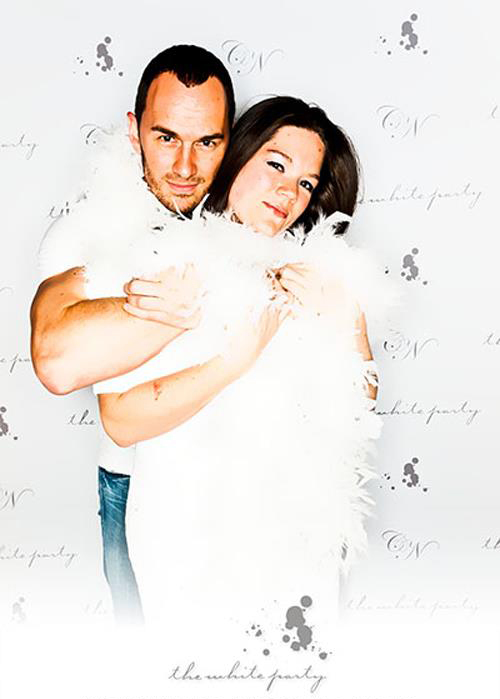 A favorite. Then there is the bar dedicated entirely to cheese (when you think about it, it's absolutely ridiculous that no one has done this before), plus a wine list to spin your head (yet never disappoint). 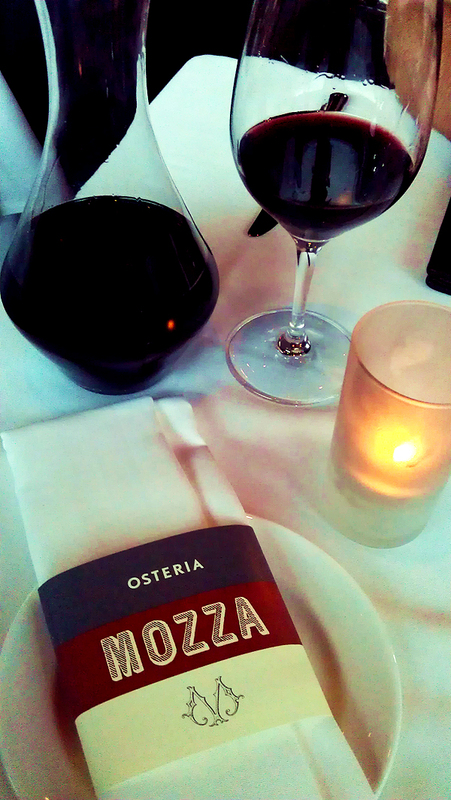 Osteria has been around awhile, so I'm breaking no ground here ... but because I blog what I love, and I love this restaurant, I must share the food. Oh, the food. Photo courtesy of Bad Hills ... check them out for more stunningly clever photography. Guess What's in the Gift Bag? On a recent stroll through the Westfield Topanga mall (which, in my opinion, features a Nordstrom with the best of all possible dress selections), I ventured beyond my favorite department stores to explore the boutiques on the upper levels. Happily, I was drawn into Guess by Marciano, on the hunt for the perfect pair of high-heeled camel-colored knee-length leather boots, which they had on sale. In my size. The last pair. Stop it. As if that magic weren't enough, the three separate clerks who assisted me were not only charming and lovely, but seemed over-the-top in their service. Being offered cold bottled water as I tried on shoes was fabulous, but the girl who offered it was genuinely friendly, never pushy, and only too happy to let me shop on my own. Classy. The kicker, though, was the gift bag that I was handed after picking up the impossibly gorgeous pair of boots and making the girls laugh. Free Paul Mitchell products, Marciano travel gear, and one darling patent leather tote bag. I realize it's good business — in me they've made a client for life — but it's still a perk worth sharing. If you've got to spend money, girls, spend it on those who treat you right. While it's not uncommon to discover that little NYC side streets and tucked-away alleys boast some of the best food on the planet, it's not necessarily as expected to discover consistent deliciousness on a busy thoroughfare like Lankershim Boulevard in North Hollywood, California. Hollywood, sure. West Hollywood, absolutely. North Hollywood ... meh. 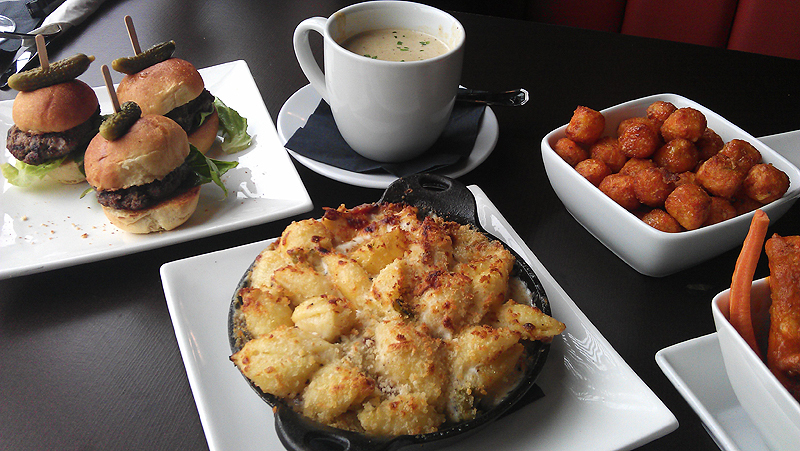 Our spread of appetizers at THE FEDERAL BAR. That said, you'd be surprised. Housed in a restored bank building once the victim of an infamous bank heist, The Federal Bar is a fantastic neighborhood bar & restaurant space with killer food, great brews on tap, and a surprisingly solid collection of spirits (they have Laphraoig 10 year Scotch. Winner). 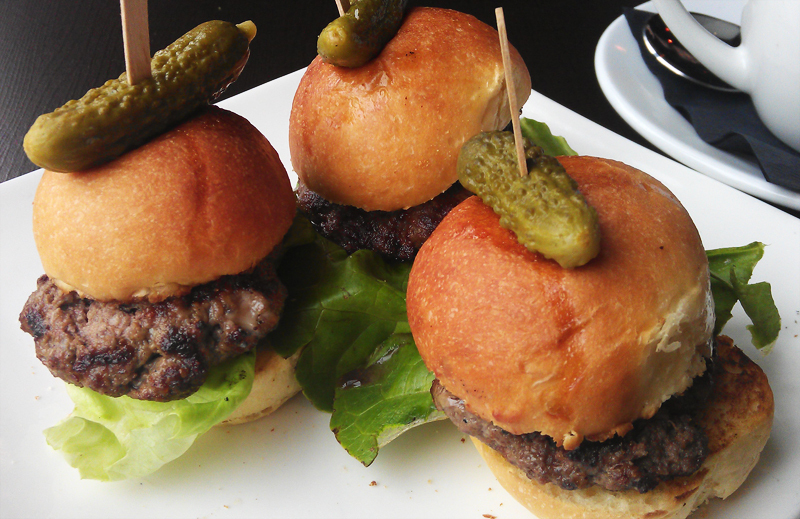 THE FEDERAL BAR: Mini-Stuffed Bleu Cheese Burgers. 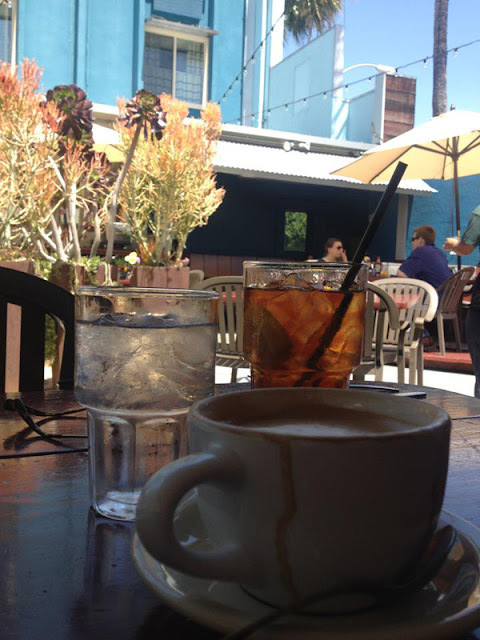 This past Saturday marked my first official FMF Deuce: a day of brunch and bullets with my dear friend Mark. As with many of my friends, the sight (and stories) of a girlie girl like me falling so in love with firearms has taken some of the negative mystique out of the hobby, making room for a healthy and intellectual curiosity on Mark's part. Naturally, I was giddily obliging when he asked me to take him to the range (and by obliging, I mean I've been trying to drag him for months). The patio at TART on Fairfax. First things first: the food. We met for brunch at Tart, across from the Farmer's Market on Fairfax. 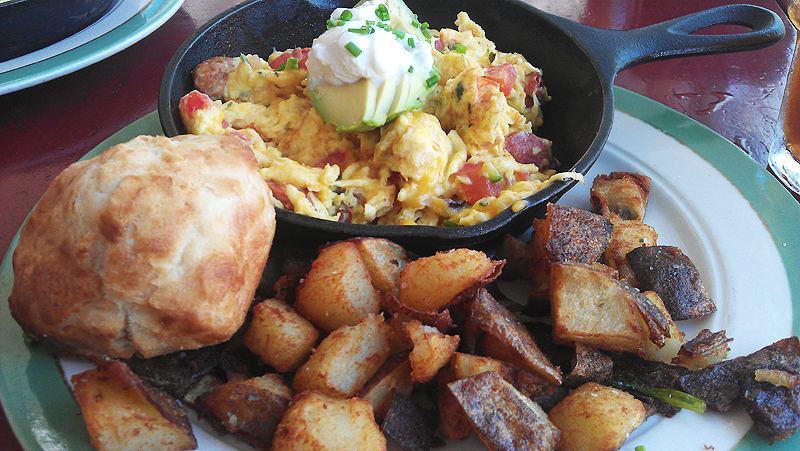 We both ordered the California Scramble, because why wouldn't we? Pico de Gallo, Chicken Andoullie Sausage, Green Chili and Cheddar Cheese, topped with sliced avocado and served with crispy potatoes. All with a cute little biscuit. And coffee. Shut up. Really, while the food is yummy, the setting and vibe are an equal draw — with its outdoor patio and shaded booths, it's quintessential California. And there are usually hot gay men aplenty. Just a note. So, I'm going to own up right now and say that I've completely hijacked my darling friend Jessica's recent blog subject, froyo, and join her in singing the praises of my favorite place for this so-awesome-it'll-never-stop-being-reinvented culinary joy: Studio Yogurt in Studio City, California. Why? It's just freakin delicious. 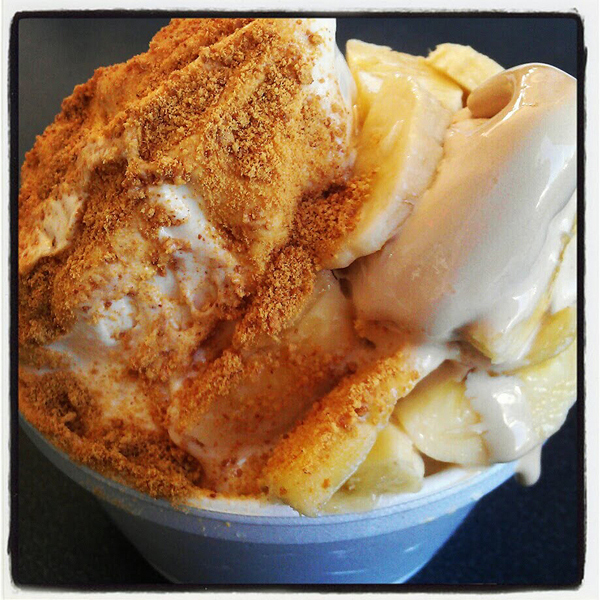 STUDIO YOGURT: Peanut butter froyo with banana slices and graham cracker crust. Pinkberry, Yogurtland and Menchies are all fine, yes, and self-serve and all that, but Studio Yogurt is just ... better. Here, you choose your yogurt. You choose your toppings. You have to wait in line and watch them assemble the towers of frozen creamaliciousness right before you, struggling to fit more banana slices or Butterfinger bits or graham cracker crust into the already-bulging container. It builds anticipation, this wait, and somehow, the yogurt is just so much creamier, and yummier, and more original that you don't mind waiting. Peanut butter frozen yogurt that tastes like peanut butter. Chocolate that no, isn't ice cream, but is still beautifully rich. Carrot cake that doesn't just taste like chemicals + vanilla. I love this place. Thank you, Jess, and your fabulous blog Things That She Loves, for reminding me. 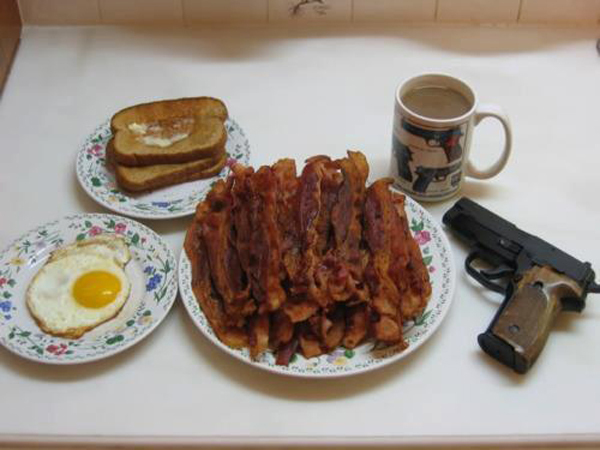 Brunch. My favorite subject. 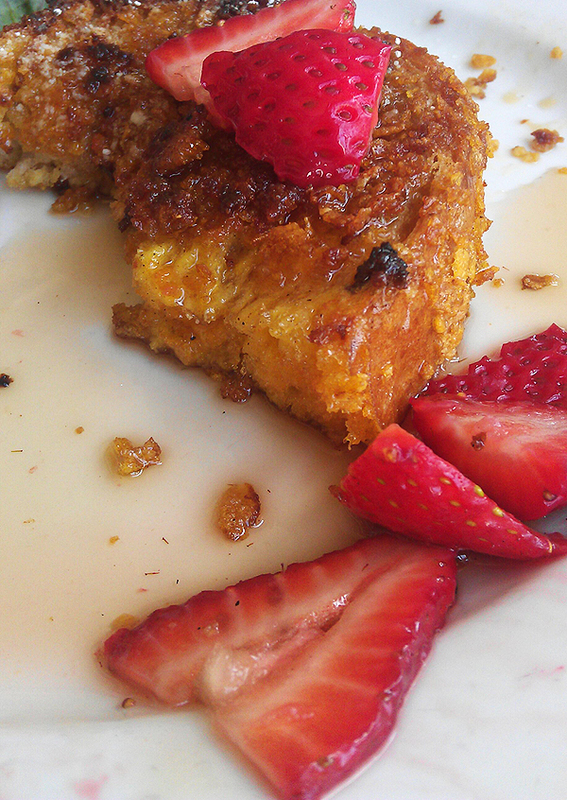 As you know, I'm crazy nuts about the crunchy French toast from Blu Jam Cafe — it's almost unbeatable. That said, there is some stiff competition coming out of Pasadena. Marston's, named "Best Breakfast in California" by The Food Network Magazine in 2010, serves a dish called Fantastic French Toast ... and holy crap they're not kidding. Marston's is that quintessential California breakfast spot — a tightly packed bungalow-style haven with horrible parking and too few tables to feed the droves who flock there — with simple comfort foods perfectly prepared. I've eaten salads here, and sandwiches, too. Good. But the point of the place is breakfast, and of all the choices, their carb options absolutely bring the house down (this said by a semi-carb-conscious Angeleno, so you know I'm not messing around). I can't say it enough — brunch is the reason I get up on Sundays. And French Toast is the reason I love brunch. Look at this thing. This is what's left of the gloriously crunchified, expertly caramelized hunks of syrup-soaked bread magic I was served. 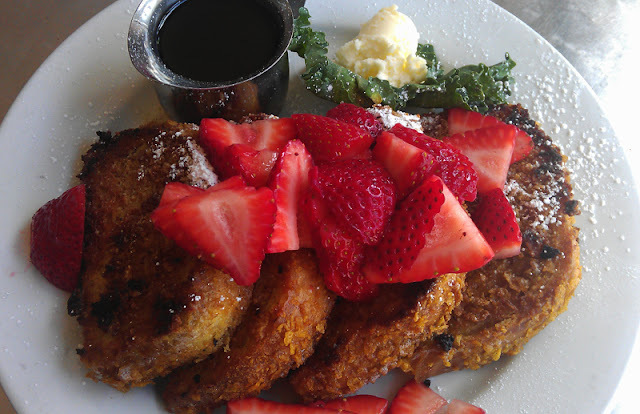 I also kicked in the extra buck for the strawberries, and while I still think Blu Jam takes the cake (literally) on accoutrements (their vanilla syrup and fruit combo kills), this is classic French toast done brilliantly. Go. Early. You will wait, but it will be worth it. And if you can't grab a parking spot in their tiny lot (though my darlings Jessica and April seem to always grab Doris Day parking right by the front door), try the meters on Raymond a block away. You'll want to walk off this carbo-bomb anyway. 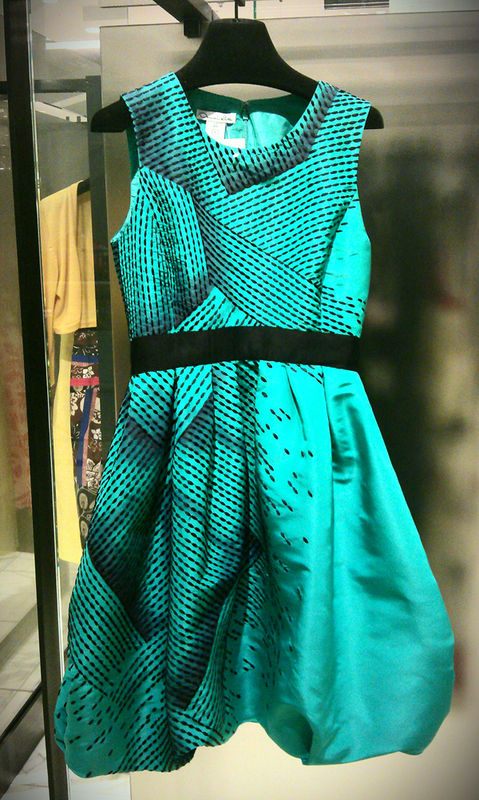 The fabric, craftsmanship and quality of this dress are better than anything else I own (and I own some damn fine things). I've long had a love affair with Oscar ... in a longing, dreamy, aspirational way ... so a little blue gem like this makes me crazy. Something about his lines, his colors, and his unparalleled ability to make a woman look inescapably feminine and flawlessly couture with a simple swash of well-made silk is magnificent. Sigh. A girl can dream. Saturday night — White Party in the hills of West Hollywood, with a white-clad guest list, white tray passed hors d'oeuvres, white cosmopolitans and cocktails, a step & repeat photo booth complete with white feather boas, a white mini-dress & stilettos for yours truly, and the company of a white hot fella. 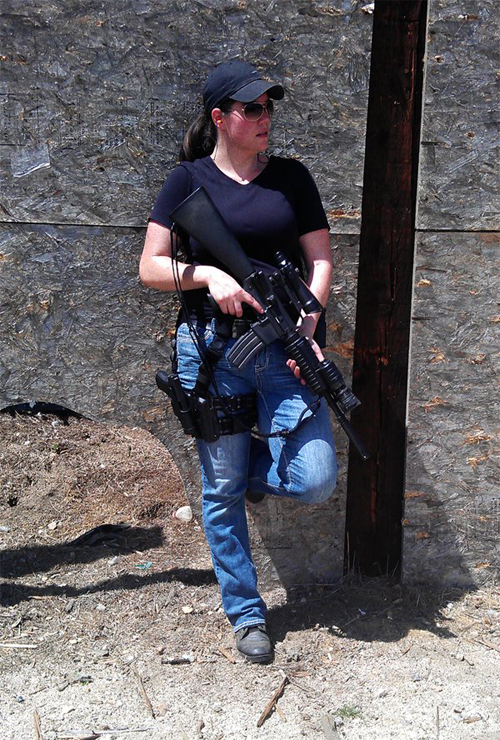 Sunday morning — target practice in the hills of Burro Canyon, with my beloved Glock 19, a gorgeous AR-15 complete with ACOG scope, a good bit of grime & gunpowder, the company of two badass chicks in S.W.A.T. gear, and one hard case master chief singing my praises all day. Oh, and by the way, target practice was topped off by a mushroom & swiss burger and fries for the long drive home. If I had taken a photo of that deliciousness this post would be an all-out trifecta. Okay, foodies, let's admit it. For all the foie gras, truffle oil, caramelized onions and pistachio foam we like to consume, sometimes there's nothing like nostalgia and a little packaged goodness to make the day complete. 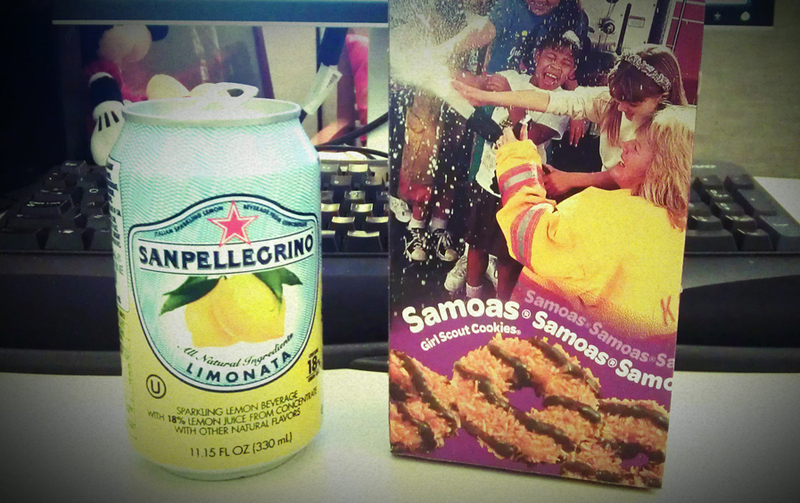 And so, I give you my afternoon: a can of San Pelligrino Limonata and a box of Girl Scout Cookies. Limonata: Tart, carbonated lemonade. It springs from the land of unicorns and magical citrus trees. Google it. Samoas: Coconut and chocolate Girl Scout cookies. Doesn't everyone on earth know this? You either love them or you don't. And if you don't, you're insane. 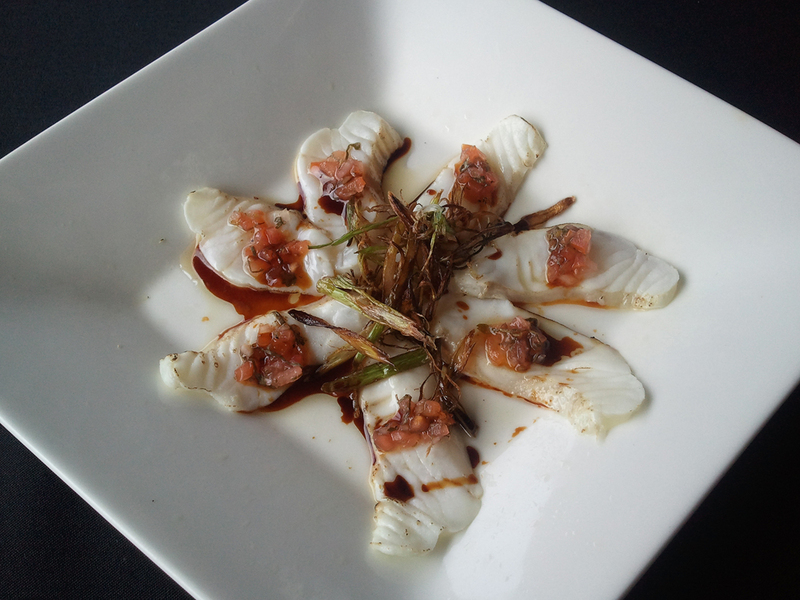 Halibut sashimi with hot oil. 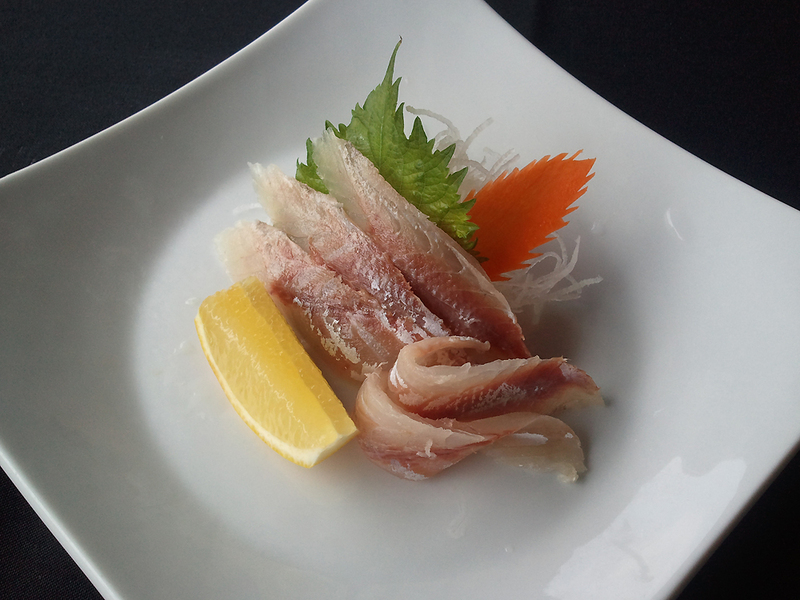 Of all the gin joints, new and old, famous and trendy, fusion and traditional, one of my consistent favorites has always been Ahi Sushi at the corner of Coldwater Canyon and Ventura. Quit your hollerin' — I know the original Katsu-ya and its offshoot Kiwami are also located on Ventura, and that both restaurants serve some of the best fish on the planet. Crispy rice spicy tuna. Kill me. I get it. But ... where Katsu-ya is genius and trendsetting, it is also overly popular and crowded. Kiwami, additionally, is extremely expensive. A friend and I dropped $300 for lunch recently (um...yes, we must factor in the bottles of sake and rare ocean trout, of which we had two wallet-busting plates), and tabs that high are easy to achieve at Kiwami (I regret nothing). For any Dark Knight fans out there, you may have already seen the plethora of snapshots and video captured of the Batmobile caravan (the original Adam West classic car, Tim Burton's first Michael Keaton Batmobile, both Joel Schumacher Batmobiles, and Christopher Nolan's Tumbler), randomly on parade through Los Angeles last week, on their way to Bob's Big Boy's Classic Car Friday in Toluca Lake, California. Well ... I am exquisitely privileged that one of my besties, Tara, was responsible for that caravan, the historic assembly of those remarkable vehicles, and the footage that was captured at Bob's. I. Love. My. Life. 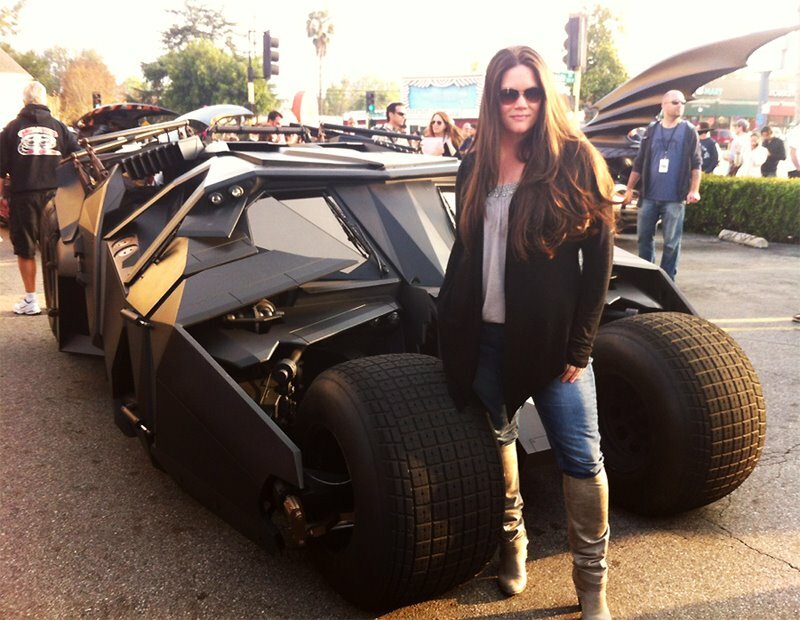 It is with ridiculous glee that I share a shot of yours truly (snapped by Tara, naturally), taken with my favorite of all the Batmobiles: the badder-than-badass Tumbler. If this shot isn't Full Metal Fabulous, I don't know what is. If you'd like to see the collection of all five (plus one badass Smart Car) you can see them here.